The process of identifying and developing new leaders who can replace others when they leave or retire is essential work that practice owners often neglect. 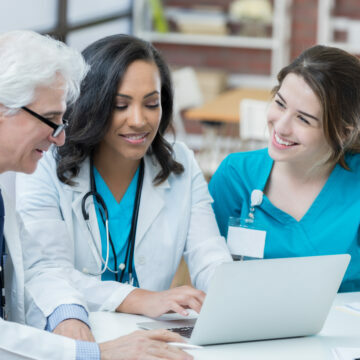 Whether one is transitioning ownership to other partners or preparing to sell the practice, succession planning is an important process that ensures your medical practice is prepared well for the future. The first thing you need in place is an emergency plan. More than once, we’ve received panicked calls from practices where the senior partner, or worse, sole owner, has passed away unexpectedly, leaving staff and patients scrambling to fill the gap. If you are a sole owner, the time is now to determine who may be able to step into your shoes if the unthinkable occurs. First, identify the areas of your practice that will need the most immediate attention. That usually means ensuring that you can meet payroll and keep the staff working for some time while your emergency plans are executed. The cash will run out quickly though if there is not someone in place to continue to generate revenues. An employed physician or mid-level provider can help sustain the business in your absence, even if only temporarily. If you don’t have someone in place already, you may consider reaching out to a colleague in the area who may be able to take over your practice in the event you die or are severely disabled. Next, determine who will own the practice upon your death. Make sure you have identified to whom your assets will pass in your estate planning. Keep in mind that in most states, you can’t pass your practice to a non-physician so you’ll need a physician to take over. Finally, make sure your staff knows what to do in the event of a sudden departure. For example, determine how your team should communicate with patients, who can access key accounts, and who will be the point person that will coordinate details. Emergencies aside, most practice owners will have the luxury of effectively planning for transitions. Note that key transitions can also be around key personnel – your trusted office manager of the last 20 years may be the keeper of vast knowledge about your business – effectively transferring some or all of that know-how before your office manager departs may be just as critical planning for the departure of a partner. It can often take considerable time to find a replacement, and you will want to make sure that there is some overlap between your outgoing and incoming managers. Moreover, adding a resignation notice provision to your employee policies for managers is a good idea to ensure that adequate notice is given before that critical team member leaves. Can you cut back on-call hours, weekends, rounds, etc., prior to retirement and remain a partner? Depending upon your compensation model, you may be entitled to the amount of your specific accounts receivable minus overhead. Or perhaps a fixed amount has been discussed, but that may need to be revised based on the current value of the practice. In many cases, the value of being a partner has been realized throughout the course of ownership, and no buy-out is considered. A fixed amount agreed to by the partners. Buy-outs are typically paid over the course of two to three years, to ensure minimal impact on the practice’s finances. However, should more than one partner wish to retire at the same time, a staggered approach to buying out may need to be implemented to avoid draining cash from the practice within a limited period. If you are a sole owner, you may have an employed physician that you can either groom for partnership or that may be willing to buy the practice from you. If not, you will want to start preparing your practice for sale, even if you intend on practicing for several more years. Operating your practice with the goal of maximizing its value will help you to realize that value well ahead of retirement, as well as ensure that you obtain the best price possible when you are ready to sell. Preparing your practice means taking steps to minimize debt, improve collections, streamline operations for efficiency, maximize productivity, and grow your practice. Be aware that there are several methods used for valuing practices, and each one produces different price points [you can read more about that in our Autumnal Equinox Issue, 2017, here: http://www.verdenviewpoint.com/2017/09/simple-methods-for-valuing-your-medical-practice/]. At the end of the day, your practice is worth what someone else is willing to pay for it. If you are in a rural area and there is not a high demand for practices, on paper the value may be high due year-to-year earnings, but due to low demand, there may only be one buyer seeking it and their offer could be substantially lower than the identified value. Typically, independent physicians make the best buyers of independent practices. Venture capitalists may have some interest, but their goal is to maximize a return on their investment. Hospitals typically don’t pay anything for practices; instead, they guarantee employment and assume the cost of transitioning medical records, data, and other assets into their organizations. For those reasons, making investments early on in your ownership will help to ensure that you maximizing profitability at all times means, and that you will have been well rewarded for your efforts by the time retirement comes around.